This USB C Hub adapter is equipped to charge your USB C laptop quickly at a max of 20V/3A while simultaneously serving as a power supply for other USB C devices (fast charging) based on PD charging protocol. Experience an exciting convenience while maintaining a stable connection to all devices. The VGA portx1：The resolution is 1080p@60Hz, downward compatible with 1080P/1080I/720. USB Type C Hub Adapter: USB C with VGA HDMI can connect and mirror a Type-C-equipped PC or Mac laptop to HDMI/VGA-enabled TV or display to achieve dual. 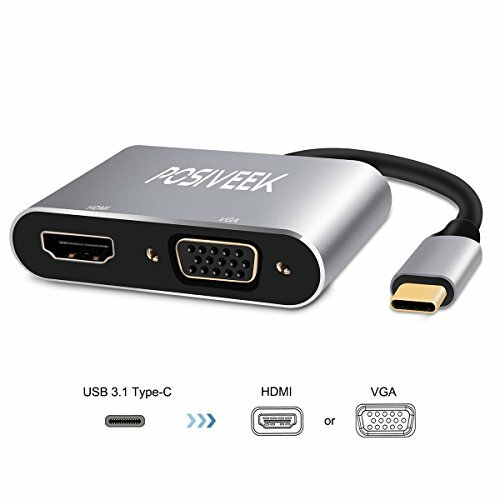 Support 4K Max：USB C Hub adapter to HDMI VGA support video resolution up 4K×2K 30HZ(3840×2160) or 1080p@60Hz and downward compatible with 1080P/1080I/720P. Dual Screen Display：The Type C Hub with HDMI and VGA can work simultaneously. Note：When HDMI and VGA work simultaneously, the maximum resolution of the two is 1080P/60Hz. Very Convenient：This USB C adapter is lightweight and small in design, so convenient for travel and business trips. Besides, this USB C HUB adapter integrates 2 ports with different functions. The USB C Hub is made of aluminum alloy, the heat dissipation is better than plastic.